Since we came back from Calabria, we’ve been touring around twice already. A veeeeery small trip to Val d’Ossola, for my friend Spleen’s wedding (who entered the dining room dancing along Rammstein music, and this, my darlings, is indeed something worth mentioning) and we happened there during the Chimney Sweepers Fest. I hadn’t been there for at least four years. I know, I’m the most horrible sister, not visiting my brother for so long. But this year he and his wife had a baby, so I HAD TO visit my niece, I have to be the favourite aunt, so I have to start early. It was my third time in Madrid, the second for Sa (who went there as a teenager and just briefly). 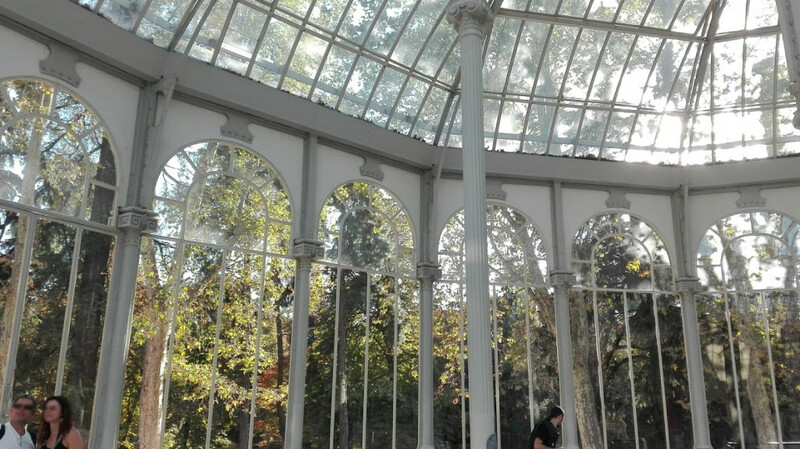 So we let the locals lead us, to the Retiro to see my favourite: Palacio de Cristal, then for the usual walk in Gran via, Plaza Mayor, Puerta del Sol, to eat a bocadillo de calamares, enjoying a glass of tinto de verano and going back home with exhausted legs. Then monumental graveyard, Reina Sofia museum to see (once again for me, for the first time for Sa) the Guernica (it’s always an emotion… plus the museum is free between 7pm and 9pm!!!). We went for dinner made of super-hipster tapas at the Sala de Despiece and then at the DeTuna, then croquetas from heaven and basically, few good days. Once again we applied our idea of microturism, you don’t really need to do much: you can stay close to home and enjoy local fairs, or you can go a little bit further for a few days and have a taste of a different culture (yes, also using those open bus for tourist, what do you care, you have to make the best out of few days, so if some places are “tipically tourist-loved” maybe there is a reason! I generally agree that visiting more unusual places, or spots that aren’t as famous, or dining in restaurants without other tourists in, gives you a more authentic idea of the place you’re visiting, but when you have so little time, you do what you can!). Let me add a third idea of microtourism: the homebased tourist. Meaning that all you have to do is pick up a newspaper or go online, read about museums, shows, things to do near home and then going full “Yes man” mode, and saying yess to all of it. Just an example, here’s what we’re planning to to in the near future: Escher show, Japan show, “path in the dark” experience by the Institute of the Blind, escape room, Daytime Hotel, and all this in Milan. Then a weekend in Turin to visit the Egiptian museum, a couple of days in Venice because my friend has never been there and I went there when I was thirteen (aka to young and stupid to appreciate it), a day in Bologna, a day in Verona, yes, only one day, but we do what we can! See? We’ll get straight to spring with all these things to do! Sono assolutamente d’accordo con questa filosofia e devo dire che abbiamo anche diversi programmi in comune…noi in più quest’anno abbiamo rifatto dopo tanti anni l’abbonamento a teatro! Un consiglio, visitate San Maurizio in Corso Magenta se non l’avete mai vista, è davvero un gioiellino!